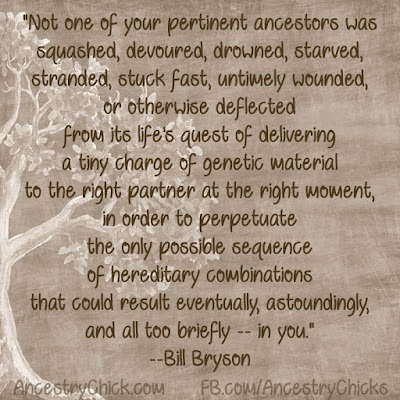 "Not one of your pertinent ancestors was squashed, devoured, drowned, starved, stranded, stuck fast, untimely wounded, or otherwise deflected from its life's quest of delivering a tiny charge of genetic material to the right partner at the right moment in order to perpetuate the only possible sequence of hereditary combinations that could result -- eventually, astoundingly, and all too briefly -- in you." This week's Surname Saturday post puts the spotlight on one of my paternal surnames: Eads. According to the House of Names website, "the surname Eads originally derived from the Old English word Eade which referred to abundant riches. However, another reference claims that the name was derived from the Middle English name Edwy and the Old English word Eadwig which are composed of the elements ead meaning prosperity and wig which meant war." 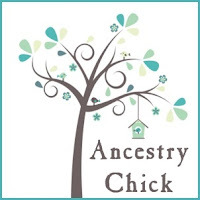 Ancestry.com says that the Eads family name was found in the USA, the UK, Canada, and Scotland between 1840 and 1920, and that the most Eads families were found in the US in 1880. And in 1840 there were 16 Eads families living in Indiana, which was 20% of all the recorded Eads's in the US. 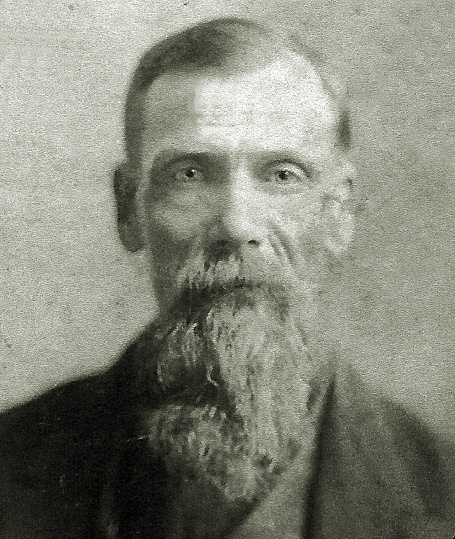 So far, I've traced my Eads family back to just my 4th great grandfather, William Eads. The earliest documentation for him is a record of his marriage to my 4th great grandmother, Margaret Weaver, in 1842. They were both living in Osage County, Missouri at that time. By 1850, according to the Census, they are living in Jefferson, Osage County, Missouri with three children: William Henry, Elbert, and Martha. On that Census, William's birthplace is listed as Tennessee. 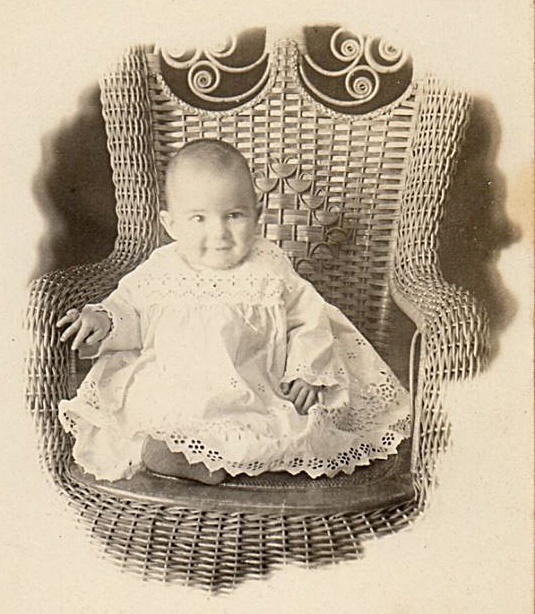 I have no trace of William after 1850, other than I know that his daughter, Louisa was born in October of 1852, so he was alive at least that year. His wife, Margaret remarried at some point, because she is living as Margaret Galien on the 1860 Census, along with her children Elbert, Martha, and Louisa. William and Margaret's son, William Henry Eads was my 3rd great grandfather. He was born on July 16, 1845 in Newton County, Missouri. He was a Civil War Veteran and a member of the G.A.R. He would marry Mary Jane Tipton in 1868. 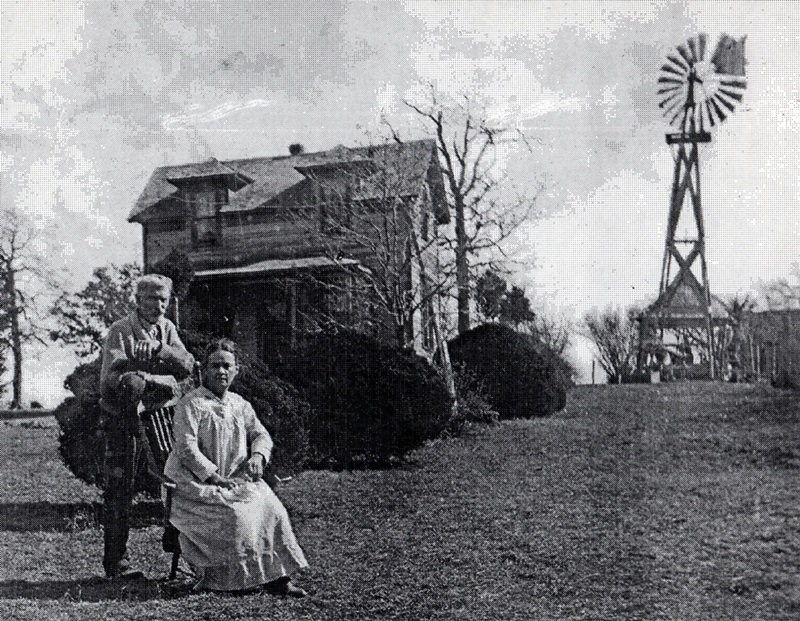 After Mary died in 1894, William remarried and eventually settled in Labette County, Kansas, where many of their descendants would live and die. William Henry Eads would also died in Labette County on June 19, 1923 at the age of 77. 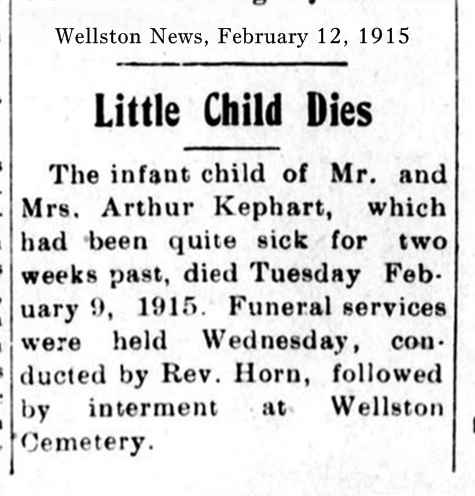 This week's Wednesday Child is my maternal great uncle, John Chester Kephart. 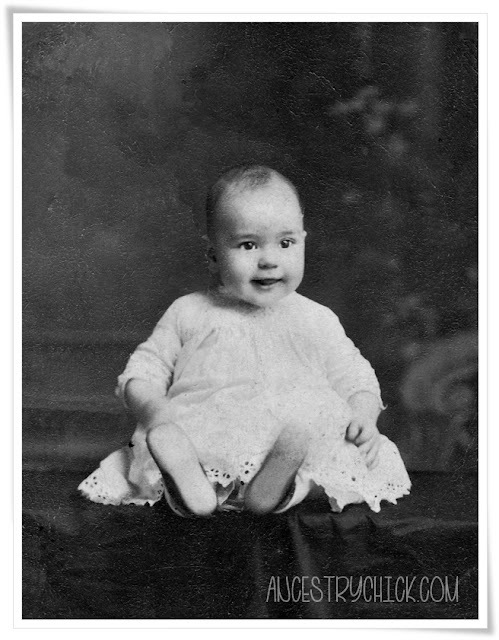 John was born on May 7, 1914 in Wellston, Oklahoma, to my great grandparents Della Mae (Swinford) Kephart and John Arthur Kephart. Sadly, John lived a very short life. He became quite ill in early February of 1915, though I don't know what his affliction was. 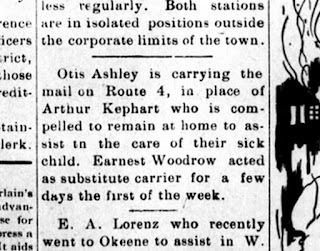 Grandpa Kephart was a postal carrier and stayed home for a time to help care for John. 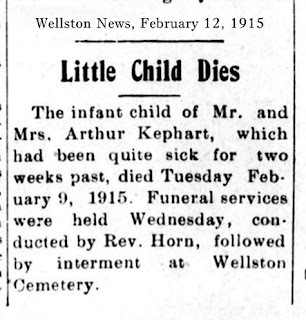 But it wasn't long after this article was posted that John Chester Kephart passed away on February 9, 1915. He had such a short life. I'm glad to be able to help preserve his memory though so that he will never be forgotten. 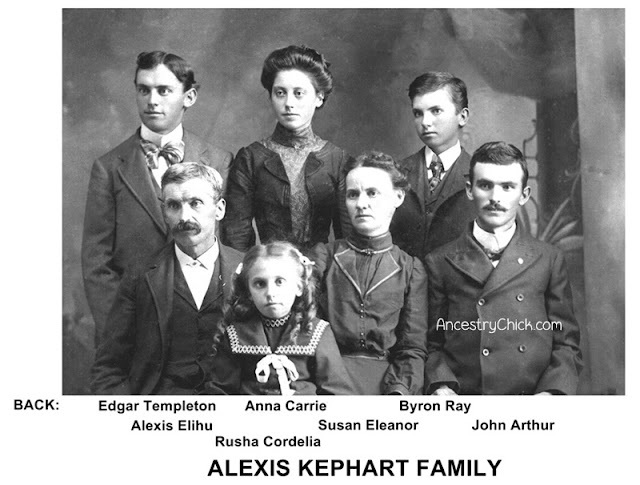 Rusha Cordelia Kephart was born in Ida Grove, Iowa on October 17, 1891 to my second great grandparents, Alexis and Susan (Templeton) Kephart. Rusha was the baby of the family, and one of two girls in the family, and by all accounts she was very close to her mother. I believe it's likely that Rusha was named after her maternal grandmother, Jerusha (Sutton) Templeton. Rusha may have been short for Jerusha, or just derived from it. Rusha was my second great aunt, and though I never got to meet her, I feel connected to her much as I do her parents. She lived very near the area of northwest Ohio that I have lived for over 30 years. She married Frank Baum in 1911 and they made their home in Ada, Ohio and raised their family there. Rusha passed away on February 2, 1972, when I was just 5 years old and living somewhere else. Perhaps it was fate that I was brought to this part of Ohio, where so many of ancestors lived and died. But fate aside, I love finding and sharing things related to my Kephart kin. Fortunately for me, passed down through our family have been memories recalled by Rusha Kephart Baum. 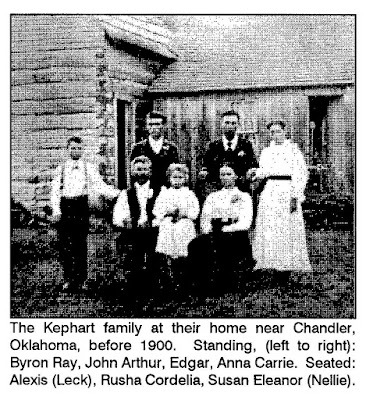 These memories help to paint a picture of the lives of the Kephart family when Rusha was growing up. I don't know who wrote these memories down, but they originated with Rusha and I want to share them here for posterity, and for any other "cousins" who may be in search of their Kephart ancestors. Rusha's words appear in italics. Note that I have inserted names or information in brackets here and there as points of clarification. I've also inserted images and here there to help illustrate what Rusha has described. Mother was born and lived in Rock Island, Illinois, until she was married. 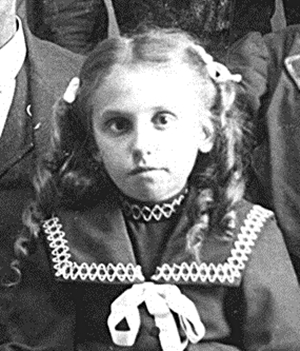 Her real name was Susan Eleanor, named for her aunt Susan Eleanor Sutton. Dad named her Nellie. After they were married at mother's home in Rock Island, they lived on a farm east and a little south of Spencerville, Ohio, where Arthur [John Arthur Kephart], Ed [Edgar Templeton Kephart] and Anna [Anna Carrie Kephart] were born. 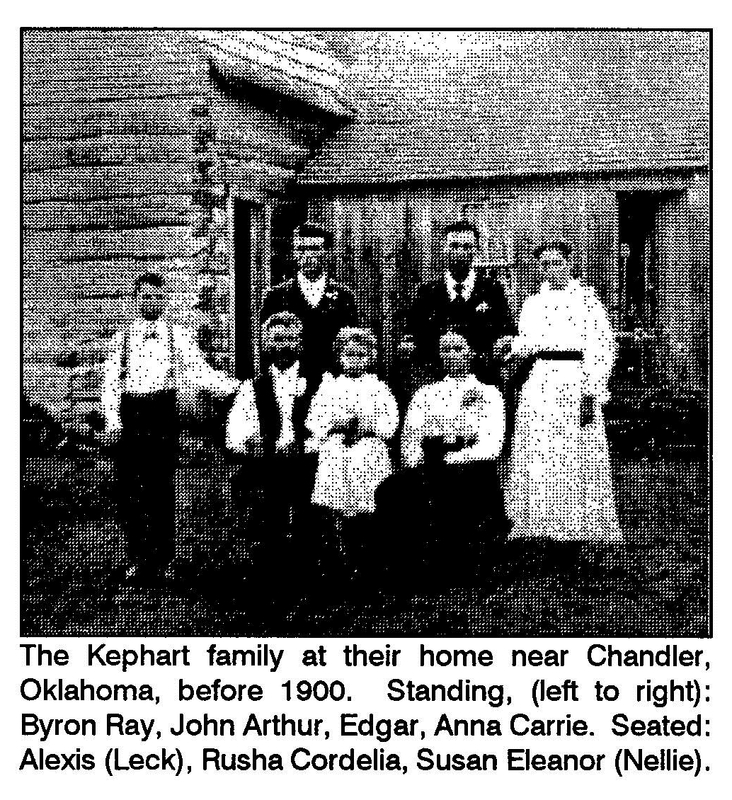 They then moved to and proved up on a government claim in Shaller, Kansas where Ray [Byron Ray Kephart] was born. Hot winds killed all their crop the second year. The third year, the grasshoppers or the locusts, I'm not sure which, took all their crop and nothing was left. Mother's sister, Matt [Martha Emeline ‘Mattie' (Templeton) Sutherland], who lived near Ida Grove, Iowa, wanted them to come there. So they sold what they could, put all they could get in a covered wagon and went to Aunt Matt's. Dad went to work on the farm for Aunt Matt's husband [Charles Sutherland] and the folks rented a house in Ida Grove, Iowa, where I was born. The winter was so cold there that after about three years they shipped their goods by train and went to Canton, Oklahoma, where mother's brother [Edwin Hall Templeton] was an army man in charge of Indian affairs. This was where the Salt River and caves were, where the outlaws would hide out after bank robberies. Our family and Uncle Ed Templeton were the only white families at the Indian Reservation where Uncle Ed was in charge. I was just learning to talk. Uncle would give out the Government issues allotted to the Indians, Mother and Aunt Lillie [Lillian (Frost) Templeton] were really self-made missionaries. The Indians were so good to us in their way. Homesteaders would come to the post office and small store, which Uncle Ed managed. Of course, the Indian children were at the post office and store a lot as it was so near to the Indian encampment. I learned to talk Indian and refused to talk white man talk, so the folks moved up to Kingfisher, Oklahoma, where uncle Jerry Brown lived, rented a farm. All was OK until the terrible tornado. Then our stone house and all that was in it but mother's big walnut cupboard was blown about or destroyed. The cupboard was left standing with not a dish broken. They gathered what furniture they could with the help of the neighbors and moved into the small town of Kingfisher. We were there until the Kepko for homesteaders was opened up. Then we got 160 acres bare land, 7 miles from what is now Wellston, and 11 or 12 miles from what is now Chandler, the county seat. First thing, Dad and the boys made a cellar and moved a little building Uncle Jerry Brown gave us. They took it all apart and moved it on wagons. Then mother, Anna, Ray and I went up. We put up a tent to help out until a log room addition could be made [photo, below]. Later they built on two more rooms. 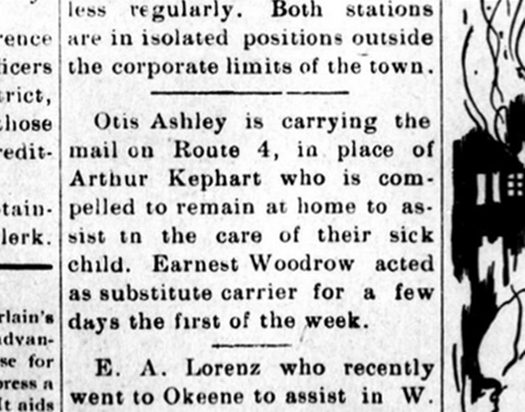 This is where the family lived when I came to Ada, Ohio, in October 1909 to go to Ohio Northern Normal School. While I was in Ada, my brother Ed was in Oklahoma City helping build homes for a company. He came to the farm and helped Dad, Arthur, and Ray build the new two-story home which you see so often see in pictures [called Cedar Lawn Farm], with mother and dad on the porch. 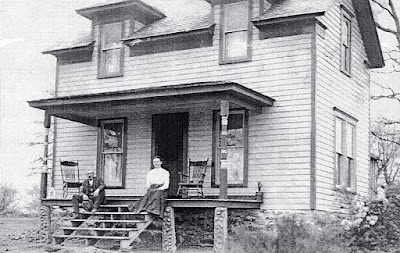 After mother and Dad died, the heirs sold the house to a man who tore it down and moved it to his place. The land surface was sold. The five children kept the mineral rights and that is why if oil is found, if ever, the surviving heirs will share. A well was put down but capped after some of the drill was broken. Ray has my power of attorney. Folks that was there said when the well was shut, they saw oil. 1-1/2 miles south there was a well producing oil. There is a very small chance that some day it might be opened. My eyes are so bad that it is hard to write this. I really love these memories, even if the dates/times may a bit difficult to follow. 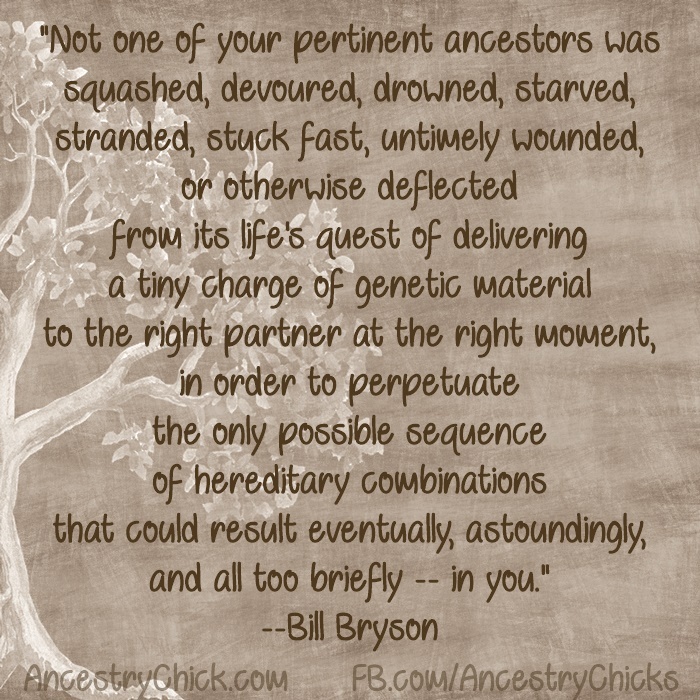 It really helps me to visualize the lives of these ancestors. I hope you enjoyed reading it too. In a future post, I will share a letter that Rusha's mother, Susan 'Nellie' Kephart wrote to her daughter for her birthday. Thanks for the memories, Rusha! Just recently my father sent me a video that shows my grandfather, Leonard Freemont Testorff, playing his fiddle. This was a great passion of his, as he had taught himself to play in the family barn and continued to play well into his golden years. It was so great to see him again, laughing and smiling and doing something he loved so much. It brought a few tears to my eyes! So, since he's been on my mind this week, I thought it only appropriate to make my Grandpa Testorff this week's Wednesday's Child. 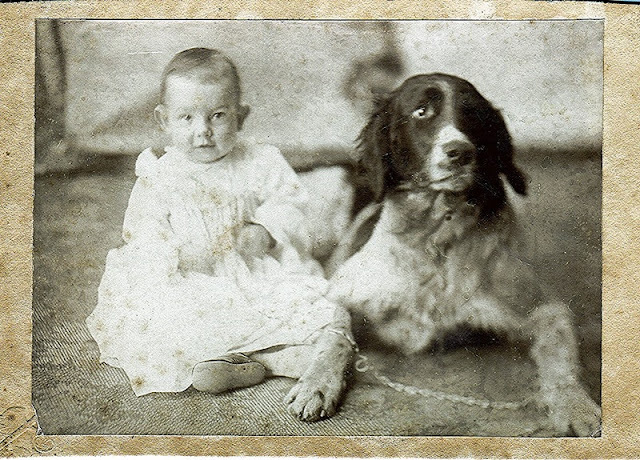 He sure was a cute baby, don't you think? You can read more about my awesome grandpa and hear some of his fiddle playing by visiting my previous blog post: Forget Me Not Friday - Leonard Freemont Testorff.